Summer might be coming to an end, but that doesn't mean the makeup launches are stopping any time soon. Kat Von D teased three new products on her makeup company's Instagram account, and two of them are vaults. Not too much information has been announced on the creations but that hasn't stopped the beauty world from speculating. Kat Von D loves to tease her fans with new products, and this time is no different. She uploaded three videos to the Kat Von D Beauty Instagram to show off the the new products. From the sounds of it, she's just as excited about the launch as her fans are too. 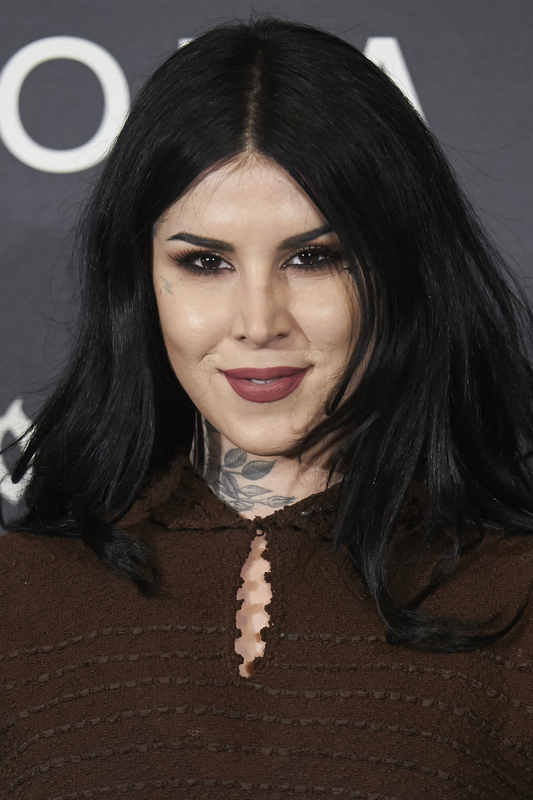 The videos feature three different Kat Von D Beauty leaders holding a brand new product, while the tattooer turned makeup creator giggles in the background. The new vaults are what people are the most excited about. One is an all-black, coffin-shaped vault that zips all the way around, while the other is envelope-shaped clutch. The makeup brand has only launched one vault so far, so this is pretty big news. In the third video, the ladies showed off a wax sealed handheld mirror. There's no telling how much they'll cost, what's in them, or when they'll launch yet though. It's no surprise that the beauty world is already buzzing with speculation as to what could be inside. Trendmood, a popular beauty Instagram, wondered if the envelope vault could be filled with The Everlasting Obsession Liquid Lipsticks because the packaging matches. The large zip vault has the same coffin shape as their Shade + Light Eyeshadow Quads, so that could be a hint too. Honestly, there's just no way to know for sure. The company has so many fan-favorite products that it could be anything. Kat Von D Beauty continued to tease their fans by posting a Twitter poll asking what people think are inside. The options are liquid lipsticks, brushes, eyeshadow palettes, and all of the above. The large majority seems to think that it's a little bit of everything. If you ask me, the poll is their best hint so far. Maybe they're going to blow everyone away and throw in tons of different products. Here's what other people have to say about the secret products. It doesn't even matter what's inside. Even the mirror has people excited. It will be be worth it no matter the cost. Bottom line: fans are pretty darn excited.